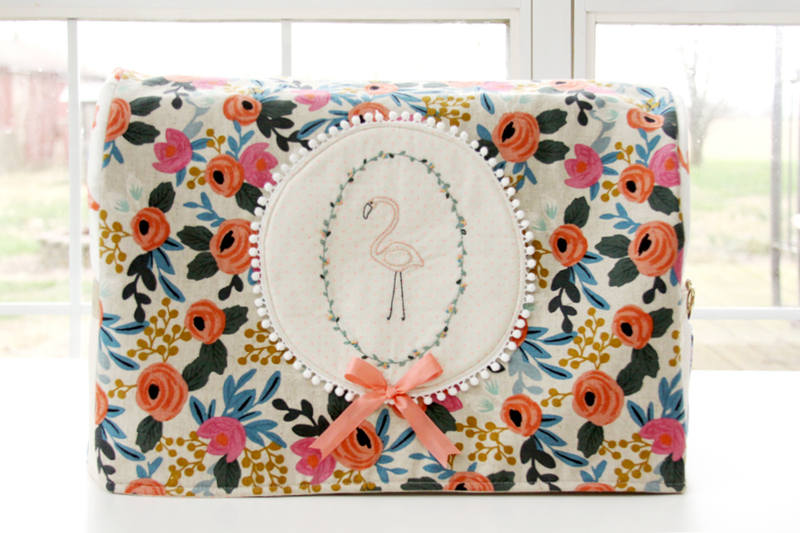 I’m so excited to show off my new Floral Flamingo Sewing Machine cover! I shared this a few weeks ago over at Fabric.com and I’m sharing it here today! 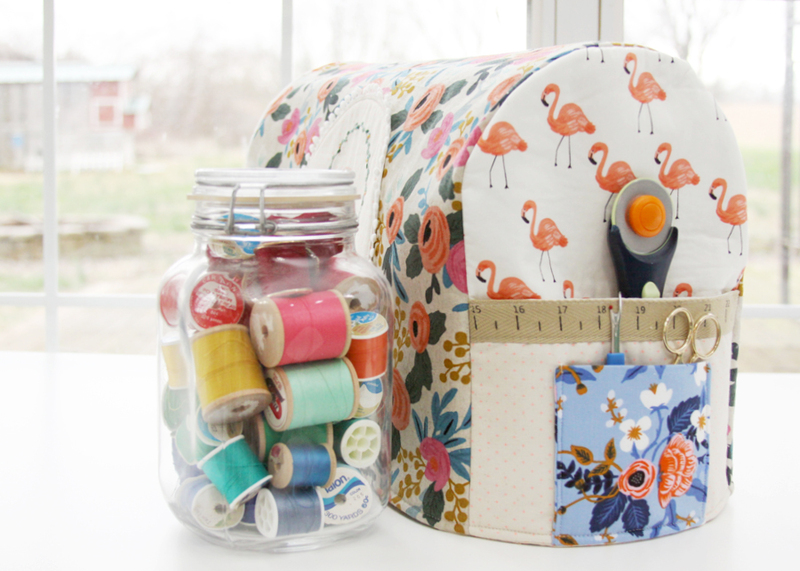 Sewing Machine covers are great for keeping the dust off your machine when you’re not using it – and this one has some great storage pockets on the side too. They are perfect for holding your scissors, seam ripper, a measuring tape – all the little tools you like to have handy when you’re sewing. 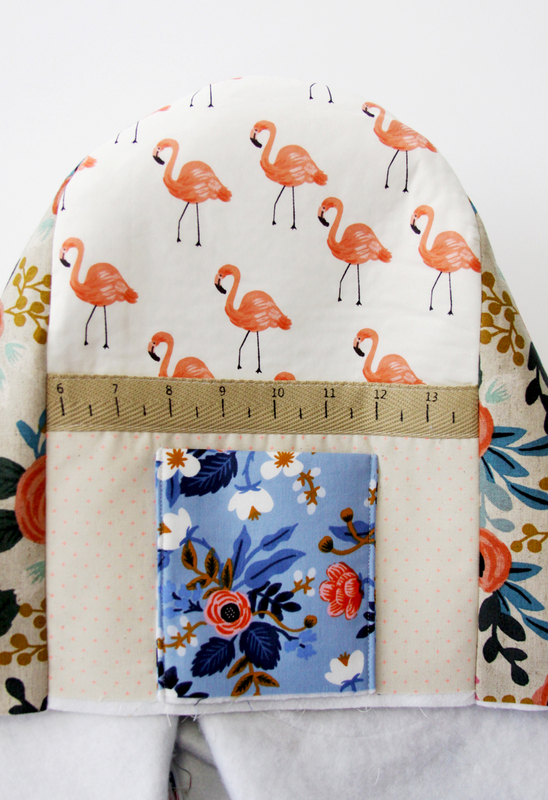 I used the new Rifle Paper Co line from Cotton + Steel for this – I couldn’t resist those cute little flamingos. 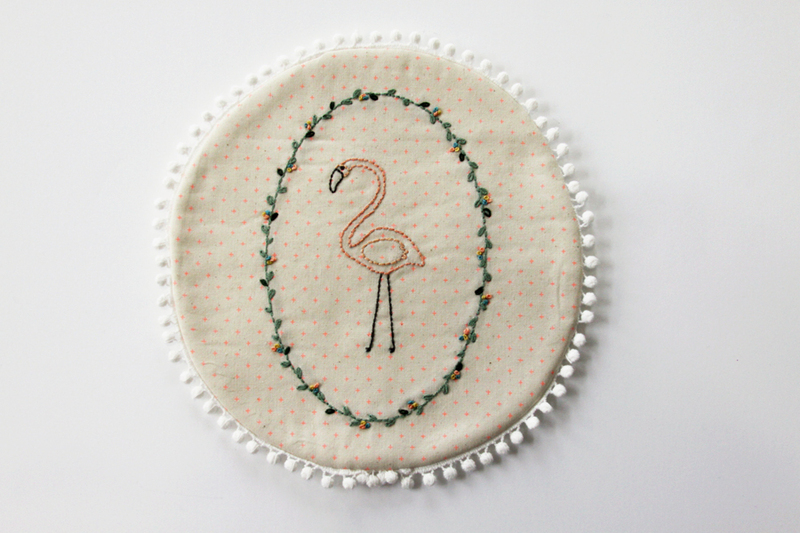 To add a little decoration to the front I created a simple Flamingo Embroidery design, I think it looks sort of like a flamingo cameo! Begin by tracing the embroidery design onto the Add it Up fabric. 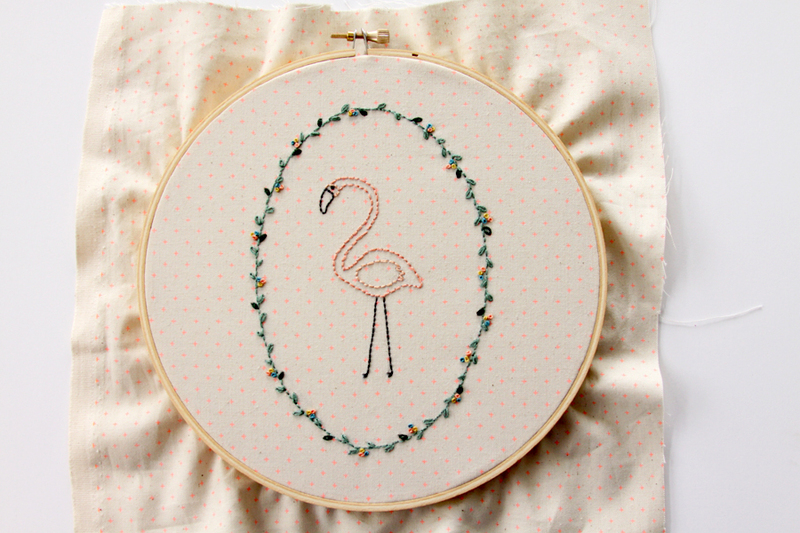 Stitch the flamingo according to the pattern. 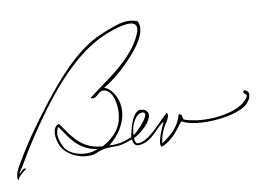 If you need embroidery tutorials, check out my Embroidery Tips page. To create the little embroidery panel, remove the stitchery from the hoop. Along the line made from the hoop, sew the trim onto the fabric withthe edging pointing in towards the center. Iron a 9″ circle of fusible fleece to the wrong side of the stitchery. Place the 9″ square of muslin on top of the stitchery so right sides are together. Sew all the pieces together, just inside your trim stitching line. Carefully cut a slit in the muslin, making sure you don’t cut the stitchery underneath. Trim the seam to 1/4″ and turn the stitchery right side out through the slit in the muslin. Press. Press the 28″ x 18″ piece of fusible fleece to the wrong side of the 28″ x 18″ outer fabric piece. Fold the piece in half and mark the center. 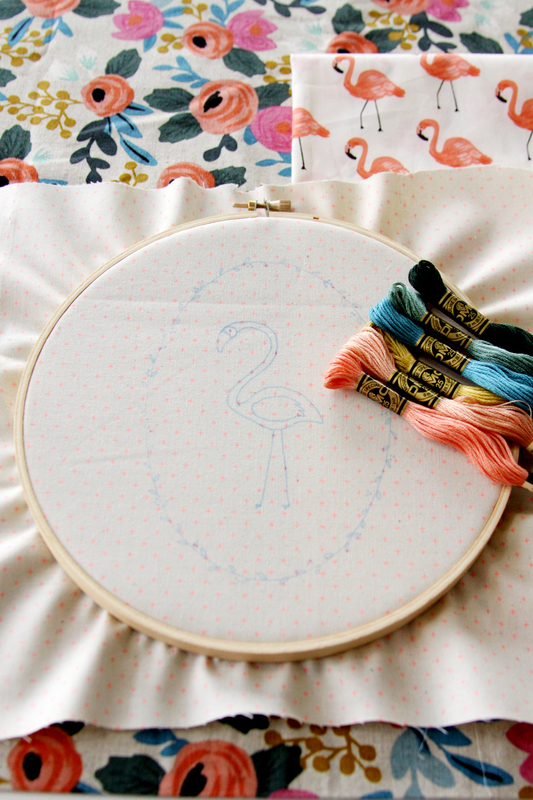 Place the flamingo embroidery in the center of the front half. Stitch in place just inside the edge. 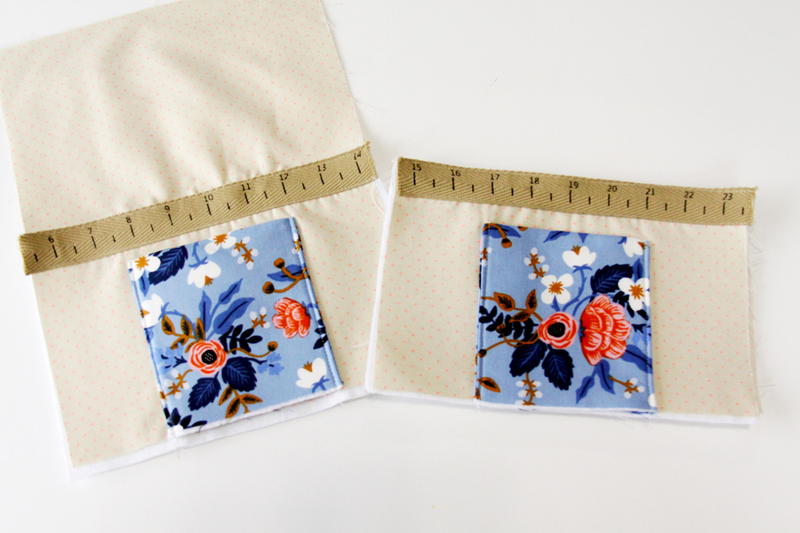 For the small pockets, press the 5″ x 4 1/2″ fusible fleece to one end of the 5″ x 9″ fabric. Fold the fabric in half, wrong sides together. Sew the two side seams closed with a 1/2″ seam allowance. Repeat for the other pocket. Turn right side out and press. 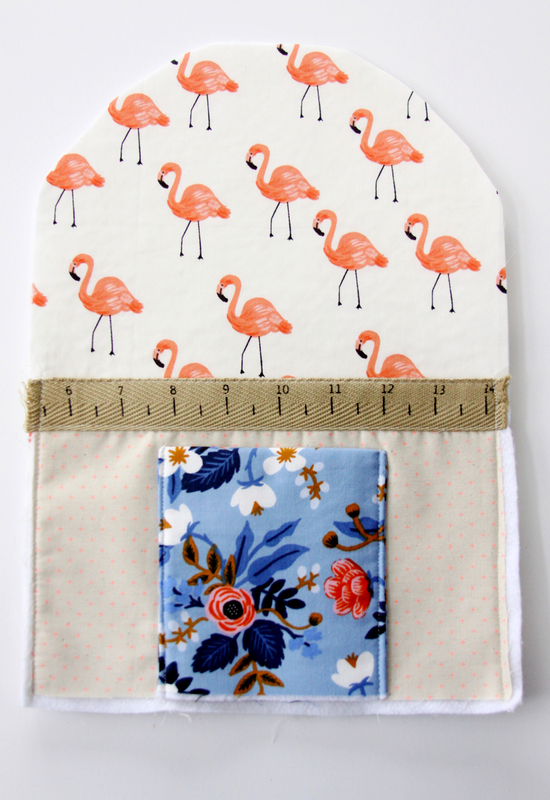 Press the 9″ x 6″ piece of fusible fleece to one end of the large pocket piece on the wront side. Sew the small pocket in the center along the bottom edge, along each side seam. Sew the trim at the middle point of the fabric, so the top edge of the trim lines up the center point of the fabric. Fold the piece in half, wrong sides together and press. Place a pocket piece on each of the side pieces so the bottom edges line up. 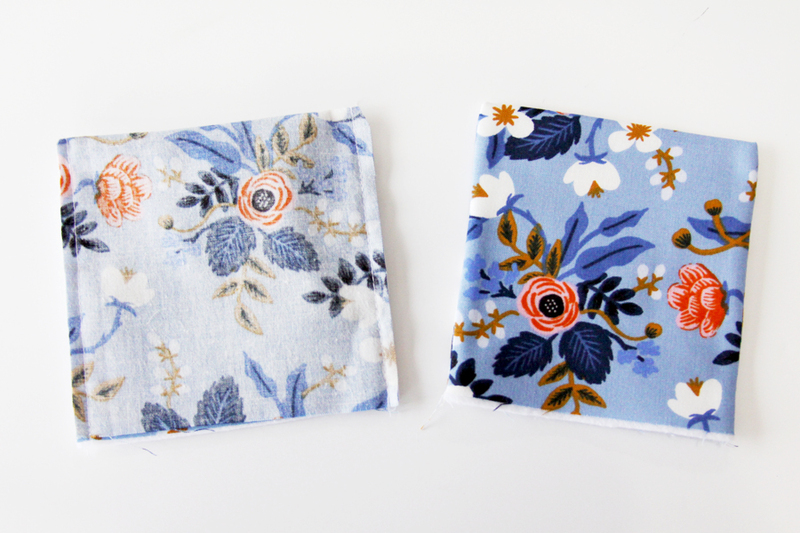 Sew the sides together with a 1/4″ seam allowance. This will baste the pockets to the side seams but also strengthen the seams. Pin the edges of the main panel along the sides and top edge of the side pieces. You may have to ease the top a bit, just use lots of pins to hold it in place. Sew the seams with a 1/2″ seam allowance. Turn right side out and press. Sew the lining side pieces to the main lining piece. Leave an opening in one of the side pieces about 7″ wide for turning. 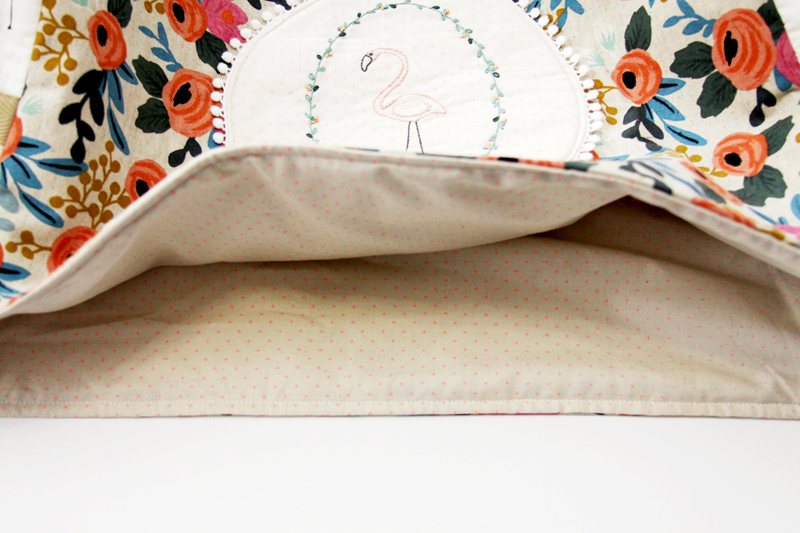 Place the lining and outside fabrics right sides together and sew around the bottom edge. Trim the seam. Turn right side out through the opening in the lining and press. Top stitch the bottom edge, 1/4″ above the seam. Hand sew the lining closed. 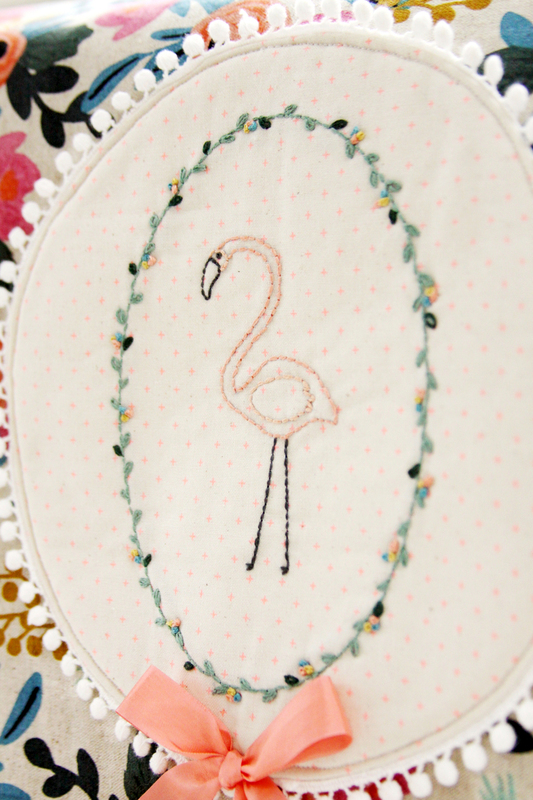 If you like, add a little ribbon bow to the bottom edge of the flamingo embroidery. 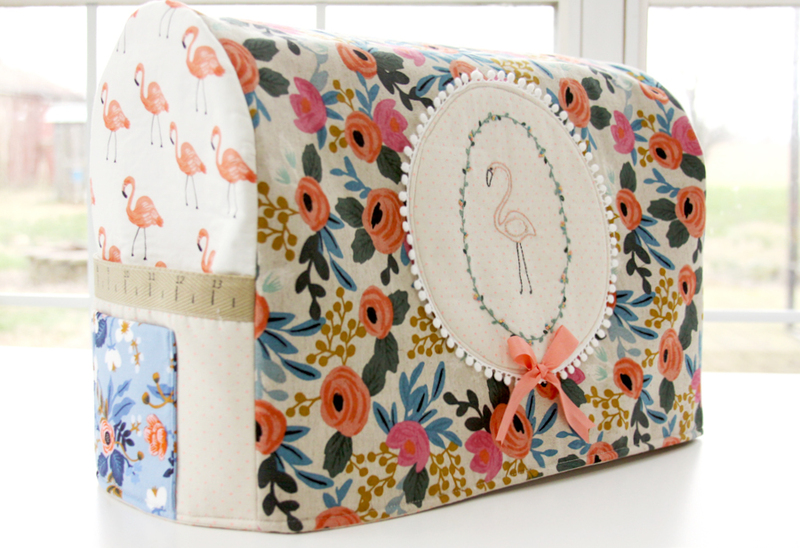 And now you have a cute new cover for your sewing machine! I hope you like it! I’d love to see a photo if you make one up! When I get my sewing room cleaned up and organized am going to make pretty cover for fairly new machine. Should be ashamed of myself not sewing for so long. While after getting new sewing machine, had right shoulder replaced then physical therapy for months, then 22 yr. old grandson died last June, just lost heart for much of anything. Trying to get myself back into crafting and wanting to do things I used to love. Seems to be slow process. Think should have gone to grief counseling. Your machine cover is so darned cute and seems to be quite straight forward, will be good challenge to get myself going again as there’s several projects I want to do. 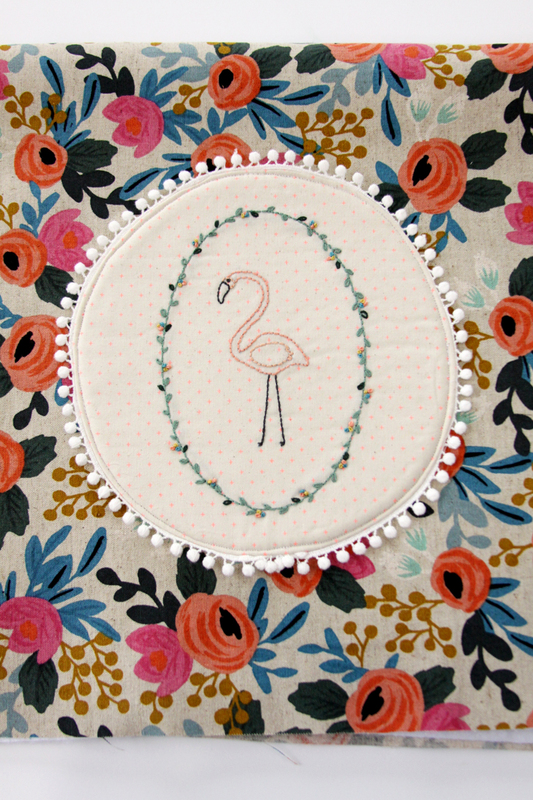 The little extra embellishment of flamingo on front and pockets has me inspired to get mess cleaned up and sew. Thank you so much for sharing this wonderful cover. It’s never too late for grief counseling. Go and heal. I love flamingoes. Thanks for sharing your ideas with us at #overthemoon link party and hope to see you next week. Love your tutorial. Pinned & sharing. Thanks for joining the Inspiration Spotlight Party. This is gorgeous. Your sewing machine must feel very appreciated. This is darling! So much cuter than the plain old white vinyl cover I have over my machine. Pinned and sharing. Thank you for joining us at Family Joy Blog Link-Up Party. I hope you will join our next party starting Sunday at noon EST. Loved it gave me an idea no how to use some of my fabric stash. I will be making several of them for my machine’s. Thank you for sharing this. I am a elephant collector person. I can’t wait to make this. Made mine differently, just a single layer of fabric as it is just a dust cover, no need of pockets either as I have storage boxes. I did allow a gap in the back seam so the machine can be picked up and moved, don’t have the luxury of a special sewing area, has to be shared between other uses. The other machine has a handle on the top so that one needed a gap in the center top seam so we can pick that machine up as well. Really like yours and might pad and line my covers but I’ll wait and see. 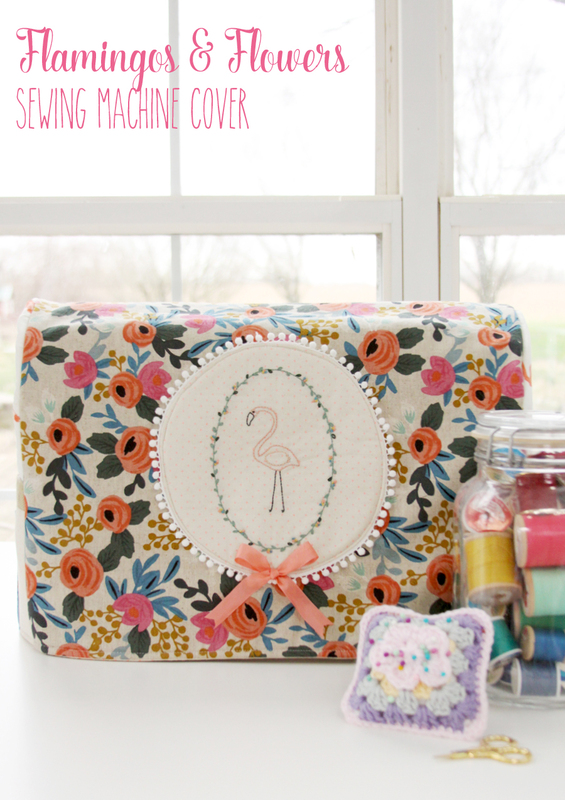 This is so cute, I will make the same cover for my sewing machine too. What are the dimensions of the cover? It’s lovely. Thank you.